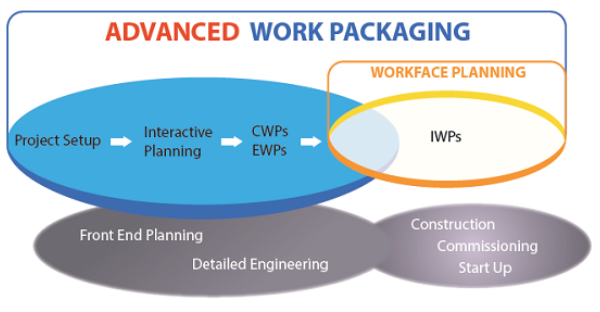 Advanced Work Packaging (AWP) refers to an approach for planning the delivery of capital projects that aims to maximize productivity at the work face by aligning the deliverables of engineering design with what is needed in construction. This article explores questions such as: What does the AWP approach entail? What success may be expected? Is there room for improvement? As conceptualized and described in the literature, AWP covers a broad scope of work. It also extends the more narrowly conceived approach called WorkFace Planning (WFP) that focuses on increasing productivity at the work face. By focusing on maintaining productivity at the construction field, AWP is broader in scope by aiming “to provide the construction work face with everything they need to successfully execute their work.” It does so by defining a spatial breakdown of the project into so-called Construction Work Areas (CWAs). Each CWA consists of discipline-specific Construction Work Packages (CWPs), which describe what is needed in construction area-by-area and when it is needed. In turn, each CWP requires engineering to be completed by design area and results in so-called Engineering Work Packages (EWP). Finally, those CWPs get subdivided into Installation Work Packages (IWP), that consist of the work a construction crew of the relevant craft can do in one or two weeks. AWP involves breaking the project into pieces and sequencing those pieces of work to be done according to a project schedule. With the schedule in place, it then also involves aligning and synchronizing the many supply chains that “feed” the system, such as those providing made-to-order materials (engineered equipment and fabricated assemblies), made-to-stock materials (e.g., commodities), and information to the site, so that all that is needed for field work will be available when needed at the work face. How can one contest the goal of maximizing field productivity? While it is obvious that there is no point in “wasting” field resources (capacity, inventory and time), what constitutes “waste”? To understand that alleviating one “waste” may, in effect, create other and possibly greater “waste” elsewhere, one must adopt a systems view on the design of the project production. From a production systems perspective, many established project management practices fail to address system design issues and lack corresponding metrics. Adopting a project production view as an alternative to the established project management view, researchers have been able to apply a different rationale for project breakdown, referring to the pieces as “chunks” that get defined in the process of Work Structuring. By augmenting and refining the conceptualization of AWP using project production thinking, the benefits that current practices claim may indeed be realized.